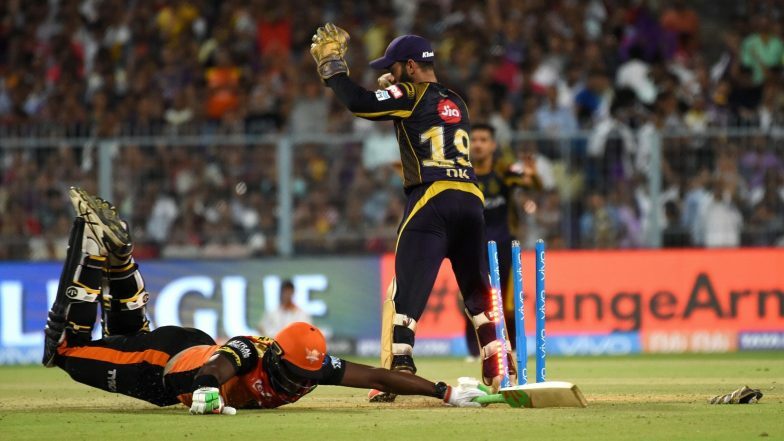 The Eden Gardens was all set for the electrifying contest between the Kolkata Knight Riders and Sunrisers Hyderabad in the IPL 2019. The teams were all set for their opening game in the 12th edition of the Indian Premier League. In the game, we had a few records and stats which were made. So LatestLY.com brings you the stat highlight for the match. After winning the toss, Kolkata Knight Riders elected to field first and put the visitors to bat. David Warner, who was making a comeback in the IPL after a year looked tad bit nervous in the first over but then went on a hammering spree. KKR beat SRH by 6 wickets. Jonny Bairstow also joined the party and both contributed to 118 runs for the first wicket. After Bairstow departed, Warner built a 26 run partnership with Vijay Shankar who scored 40 runs. Warner’s dream comeback was obstructed by Andre Russell who got him on 85 runs from 53 balls. Yusuf Pathan made way to the pavilion scoring a single. Manish Pandey scored 8 runs off 5 balls. On the other hand, KKR lost an earlier wicket in form of Chris Lynn who made way to the pavilion on the score of 7. Nitish Rana stayed on and tried to stabilise the innings scoring 68 vital runs for the team. After the departure of Robin Uthappa, Dinesh Karthik, Andre Russell stayed on. At on one point in time, it looked like the Orange Army would walk away with the victory but the KKR all-rounder played a magnificent inning and guided the team to victory. Suddenly, it was raining sixes and fours at the Eden Gardens as he smashed four fours and four maximums, thus bringing down the asking rate drastically. In the end, KKR needed 5 runs from three balls which were quite a cakewalk for the hosts as they won with a couple of hours to spare. Now, let’s have a look at the stats of the match. # David Warner's 85 is his 37th IPL half-century. # Nitish Rana scored his 6th IPL half-century during the match. # This is the third highest target chased down vs SRH. As of now, we have Mumbai Indians locking horns with Delhi Capitals in the second match of the day. Sunrisers Hyderabad will next lock horns with Rajasthan Royals on Friday, March 29, 2019, at the Sawai Mansingh Stadium.